From Genes To Fangs: Snake Venom Recipes Remain Mysterious : Shots - Health News The search for a universal treatment for snakebites is complicated by the fact that each species has a very different cocktail of toxins. Even knowing a snake's DNA might not help much. Saw-scaled vipers may be small, but they pack a nasty venomous punch. This one, Echis carinatus sochureki, was used in a study on snake venom. When a saw-scaled viper sinks its fangs into a person, it isn't pretty. Toxins attack the victim's capillaries. The body launches an immune defense, as it would with an infection. But that takes time — too much time. The venom quickly dissolves the tiny blood vessels, and the body runs out of clotting materials before it can repair them. "It's what we call 'systemic hemorrhage,' where an individual is essentially bleeding internally and externally," says Nicholas Casewell of the Liverpool School of Tropical Medicine. "It's really horrific." The World Health Organization estimates that between 20,000 and 94,000 people die from snakebites every year. Doctors would love to have a universal antivenom that would let them treat any snakebite, regardless of the species. But research that involved milking six species of deadly snakes suggests that coming up with a universal antidote could be a lot harder than expected, says Casewell, the lead author on a paper out Monday in Proceedings of the National Academy of Sciences. That's because each snake's venom is a mixture of toxic proteins, and not all venoms are made the same way. Snakes create venom in a gland much the same way that humans create spit in salivary glands. It has been thought that genetic differences are behind the wide variety of poisonous concoctions that snakes are capable of making. "But what we found was that many of the snakes that we studied actually had very similar genetics in terms of the genes that actually make toxins," Casewell says. "And what was causing variation in venom is differences in how these genes are transcribed from the genome to be expressed in the venom gland. And then also how those transcribed molecules are translated into the proteins." In other words, it's hard to predict what toxins will show up in a snake's venom just by looking at its genes. 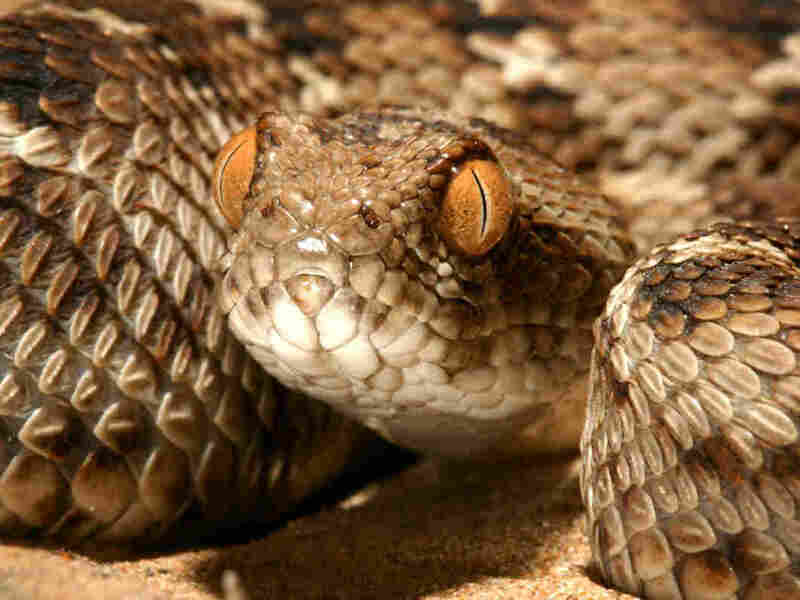 A viper like the one pictured above may have gene A, known to code for toxin A. But that toxin won't necessarily show up in the snake's venom. In the venom gland, toxin A may break into a few proteins, or couple with others to form new molecules. That kind of reaction can affect the mix of substances that could be unleashed on the next unfortunate mammal to cross the snake's path. It also means that making a one-size-fits-all antidote could be really tricky to devise. "If snake venom composition varied just simply according to the genetics of the animal, then we'd be able to quite straightforwardly predict whether an antivenom for one species might work against the venom of a related species," says Casewell. "But what we're finding is that even between closely related species, when you look at the genetics of the animal, it's very difficult to predict whether then antivenom is going to work." In the parts of the world where they're needed most, antivenoms are expensive and hard to come by. Making one involves injecting a tiny bit of venom into a sheep or a horse, and collecting the antibodies the animal produces as its immune system responds. Each toxin requires a different antibody to destroy it. A universal antidote — one that could treat any snakebite — would have to include antibodies capable of responding to all of the toxins from every snake in the world. That would be one heck of an injection. It might be possible and more practical to develop regional antivenoms. "Let's start by saying, 'Which species are most important in this part of the world?' and then see which toxins are present in them," Casewell says. "And then start raising antibodies against those toxins that are really important."